Next on the pile of books I’ve collected over the past few months, and been unable to read, was Jasper Forde’s The Last Dragonslayer. I’ve always liked Fforde’s quirky style and prose, and when I heard that he had done the leap from his very successful (and wonderfully imaginative) series The Thursday Next Chronicles, and into Young Adult Fiction, I knew had to read it. 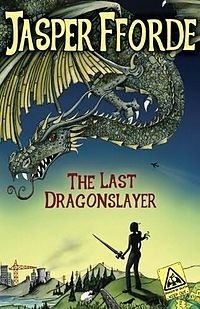 In The Last Dragonslayer, 15 year old Jennifer Strange manages a contracting firm full of wizards in the unUnited Kingdom of Hereford. Wizardry, for various reasons, is slowly losing its, um, charm, and the few practicing wizards who remain, are a rather odd bunch who can, on a good day, barely manage a simple spell to replace the wiring in a house. But when these wizards begin to experience a little extra juice in their spells, and a soothsayer makes a very specific prediction, Jennifer’s life becomes all the more, um, strange. If you like odd books, full of puns and allusions to the impractical, you’ll love The Last Dragonslayer. If you like ordinary books, and have trouble letting go and enjoying this book, it may confound you. I’ve read many of Fforde’s previous works, but even then it took me a couple of chapters to make the switch to get in the ‘Fforde mode’. Suspend your disbelief. Throw out your expectations for a normal book. This book is odd. But it’s laugh-out-loud funny at times, and very good. To say this is a YA book greatly cheats adults out of an enjoyable reading experience. Actually, I suspect that many of the jokes in here would go over the head of the average teenager. They’ll probably go over the head of the average adult reader as well. But if you like British wit at its best, pick this book up. At just 290 or so pages, and lots of fast moving dialog, it’s a quick read for a rainy day. Curl up in your favorite chair with a good, hot toddy, and enjoy.